With the Häussler dough kneading machines, you will get perfectly kneaded dough, since these operate with the proven Centra spiral kneading system – only in this way can you achieve the highest quality for your baked goods. This system ensures a equal good, homogeneous mixing of the dough – with very low warming of the dough. Our kneaders process even smaller quantities into a perfect dough. First-class processing and a long service life distinguish the Häussler machines. The appliances are easy-care, user-friendly and virtually maintenance-free. All important components that come into contact with the dough are made of stainless steel. Häussler dough kneading machines meet the highest quality requirements both for professional as private use. Only good dough makes good bread! The powerful and precise Centra spiral kneading system uniformly mixes and intensively kneads your doughs. The different rotation speeds of the dough hook and bowl support the effect of the homogeneous mixing. The working radius of the massive dough hook extends to the middle of the bowl and also facilitates the processing of the smallest quantities (around 10% of the highest quantity can be kneaded as a minimum quantity). 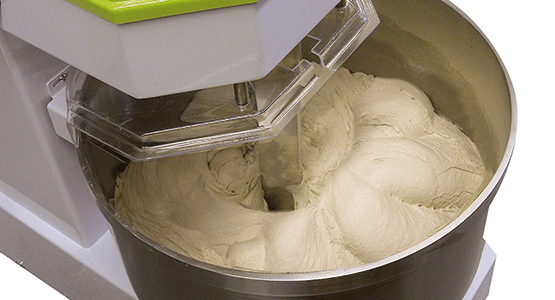 The heart of our dough kneading machines is a robust industrial motor that shows its strength even with heavy doughs. The quiet operating noise level and good footing of the machines prove it. Up to model SP 40 KA, the bowl can be removed and the kneading arm lifted up. As a result, the machine is easy to clean and operate. All parts that come in contact with the dough such as the kneading arm and bowl are manufactured from high-quality, food-safe stainless steel. The housing is made of thick sheet steel and is impervious due to a powder coating. 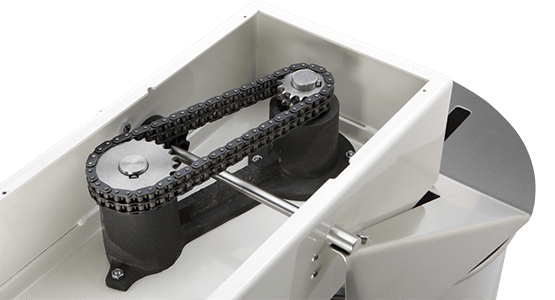 The chain drives for the kneading arm and bowl last for a lifetime. All of our machines are equipped with a circuit breaker. The machine automatically switches off when the kneading arm or protective cover is lifted up. All machines are GS (“tested safety”) approved. 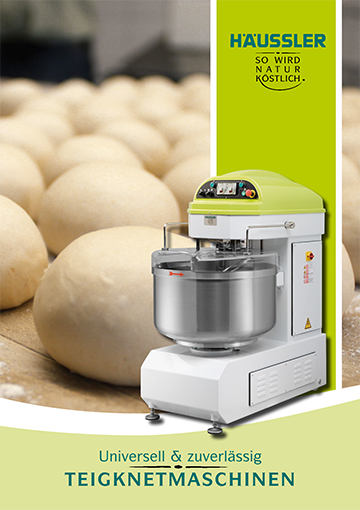 The integrated time facilitates an easy setting and monitoring of the duration of the kneading. The machine automatically switches off after the set time has elapsed and thus prevents over-kneading of the dough. Do you run a catering business or small bakery? Then the SP series is exactly right for you! Our professional dough kneading machines of the SP series also feature the industrial motor, robust construction and the Centra spiral kneading system. 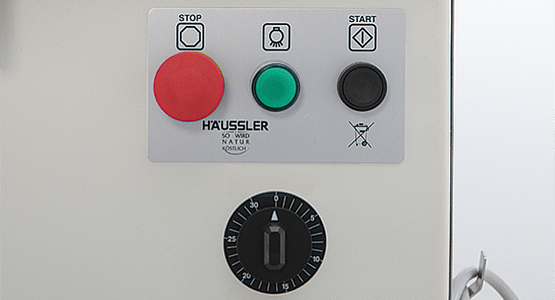 The Häussler dough kneading machines are equipped with a timer, i.e. the machine automatically switches off after the set time has elapsed. 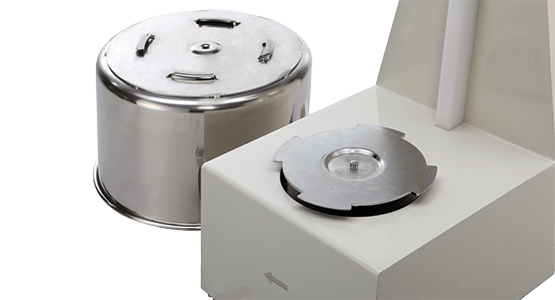 The bowl can by easily removed with a rotation up to model SP 40 KA – thanks to a bayonet lock. All parts that come in contact with dough are made from stainless steel. The powerful and precise Centra spiral kneading system uniformly mixes and intensively kneads. The working radius of the strong kneading hook extends to the middle of the bowl. The high-quality materials ensure a long service life even when processing heavy doughs, as is customary in a bakery. 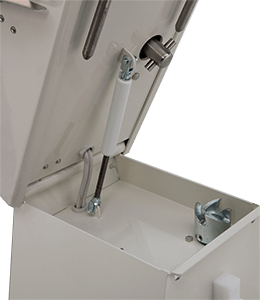 The cover of the SP machines can be folded back and the entire kneading arm can be lifted up for easier cleaning. The cord minder is on the back so that the power cable is always tidy. The pneumatic springs assist the lifting of the kneading arm and hold it upright. The ideal dough kneading machine for your bakery because a good dough produces good baked goods! The dough in every bakery is the foundation of good bread. Only someone who correctly and efficiently kneads can achieve the optimal success with their baked goods. Whether wheat, spelt, wholemeal or rye, long or short proofing, small baked good or bread dough, all depend on an optimal kneading result. The Häussler SPM 200 dough kneading machine easily kneads dough from a capacity of 60 kg up to 200 kg. 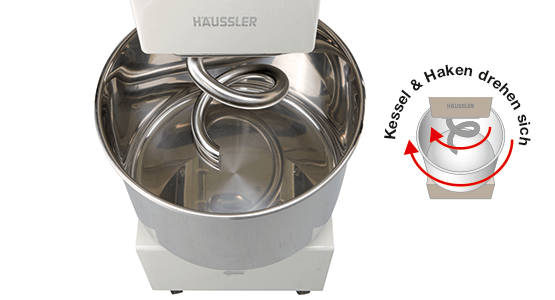 Even with sensitive doughs, such as stollen, pear bread or brioche, you will achieve the best kneading results with the Häussler kneading machine. With our kneaders, a minimum amount of approx. 10% of the specified maximum quantity can be processed. The powerful and precise kneading spiral uniformly mixes and intensively kneads your dough. Thanks to the large-scale kneading hooks, kneading times are reduced, whereby warming of the dough remains extremely low. Our dough kneading machines are equally suited for bakeries as well as pastry shops. 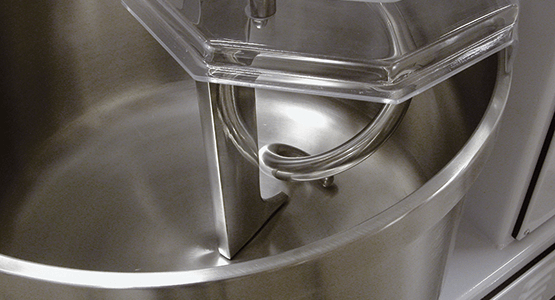 The bowl and kneading spiral are driven by two separate motors. V-belts are used for the power transmission in order to reduce to a minimum maintenance costs, vibrations and noise generation. The V-belts can very easily be re-tensioned via two external screws. 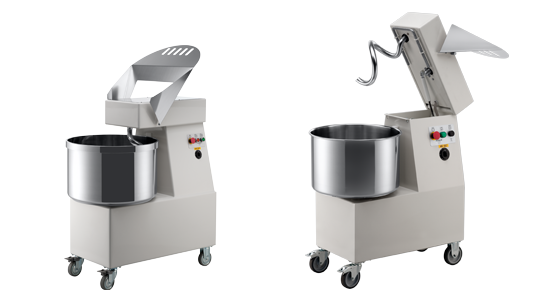 All parts that come in contact with the dough, such as the kneading arm, dough divider and bowl, are manufactured from high-quality, food-safe stainless steel. Thanks to the steel construction of the machine body, the kneaders are very robust and therefore very reliable over many years. The dough kneading machines of the SPM series can be operated in manual or automatic mode. 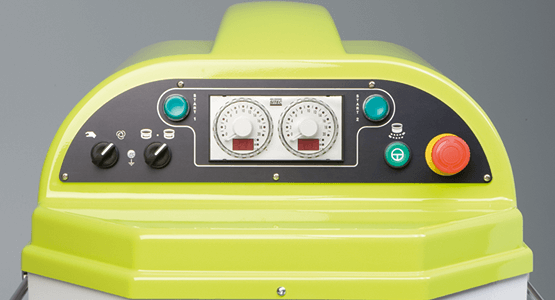 All machines have two speeds, which are controlled via separate timers. Even during the automatic kneading process, it is possible to reverse the direction of rotation. The machine automatically switches off when the protective cover is lifted up. All of our kneaders are equipped with an emergency stop switch and meet current CE standards. The massive kneading spiral and the dough divider rod work powerfully and precisely – especially with smaller quantities of dough. All components on our machines that come into contact with dough, such as kneading arm, dough divider rod and bowl, are made of solid stainless steel. The bowl and kneading arm are each driven with a separate industrial motor. All machines have a pre-kneading level for operating in the first speed. Here you will find our range of products for the kneading machines for small business and domestic use. In this brochure, we present our dough kneading machines of the SP and SPM series. 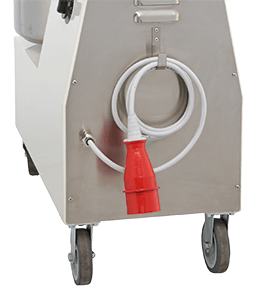 Our dough kneading machines of the ALPHA series could also be interesting for small business.